Fieseler Fi-103 V-1 flying bomb about to hit the Aldwych area of London. 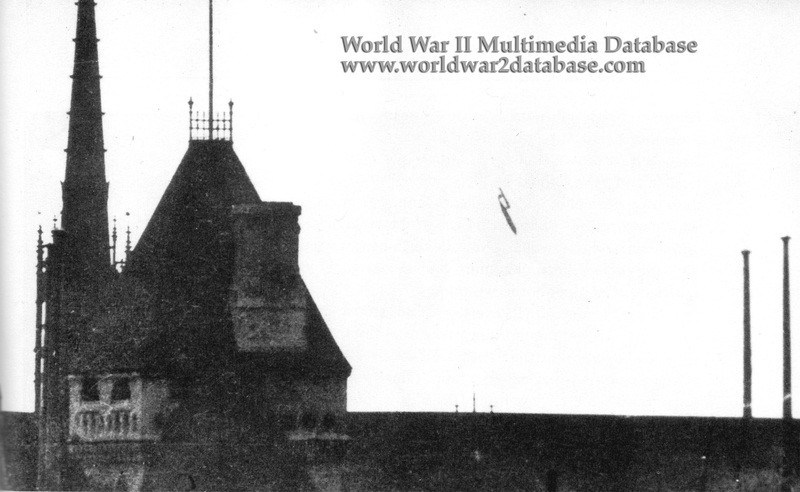 You can see the V-1 just as its engine cuts out over Waterloo Station and it drops behind the Law Courts Buildings. Despite the lack of ability for precise targeting by the Luftwaffe, this V-1 hit the Air Ministry at Ad Astral House opposite the BBC's Bush House station. Many people were outside when the bomb came down, falling onto the crowded street. People were incinerated in buses on the street and from flying shrapnel and glass from the Air Ministry's windows. 48 people were killed and 200 injured, but some sources say that 198 were killed. This may be due to the Air Ministry's underreporting of casualties at the time of the attack as a security measure.